Welcome to Jones Chiropractic Wellness Centre! 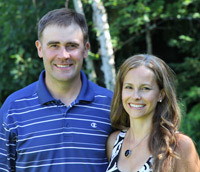 Dr. Brad Jones and his wife Laina. I’m Dr. Brad Jones. My wife, massage therapist Laina Michelutti and I are pleased to welcome you to the Jones Chiropractic website. Tour the site and find information on chiropractic and natural health care. We’re a family oriented practice and offer both relief and wellness care. Call our office today to schedule a consultation. I started chiropractic care as a teenager playing hockey and found tremendous relief from back pain and sports injuries from chiropractic care. This started me on the road to becoming a chiropractor. I attended the University of Western Ontario and received a honours degree in kinesiology and a degree in education. I then attended the Canadian Memorial Chiropractic College in Toronto and graduated in 1997. Our practice philosophy has always been trying to move patients along the road to wellness. We get to see positive changes in the office every day. To take someone from a state of poor health, pain, poor sleep, and lack of energy back to healthy, happy, exercising, eating right and loving life is deeply fulfilling. I truly enjoy working with my wife everyday. We work together with patients to form a well rounded approach to patient care utilizing chiropractic, massage therapy, acupuncture, and custom orthotics. We have been married since 1997 and have three children. 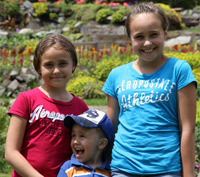 Mya, Ayla, and Jack have all had chiropractic care since they were little and are healthy and happy kids. We try to be active in sports as a family, love the outdoors, and spend as much time as we can at the family camp. Chiropractic care is part of our family’s health strategy. I get adjustment myself at least twice a month and find this keeps me from headaches, helps me sleep more soundly, and allows me to stay active in sports and other hobbies. I adjust my wife and kids regularly and we all take regular supplements in addition to eating healthy and exercising regularly. Thanks for visiting our site. I look forward to meeting you in person and learning how we may be of service to you. Call our Hanmer chiropractic office to get started with chiropractic care today!